As part of the Mom It Forward Influencer Network, this post is sponsored and I am being compensated for my participation in this campaign. The recipe and all the opinions expressed here are my own! 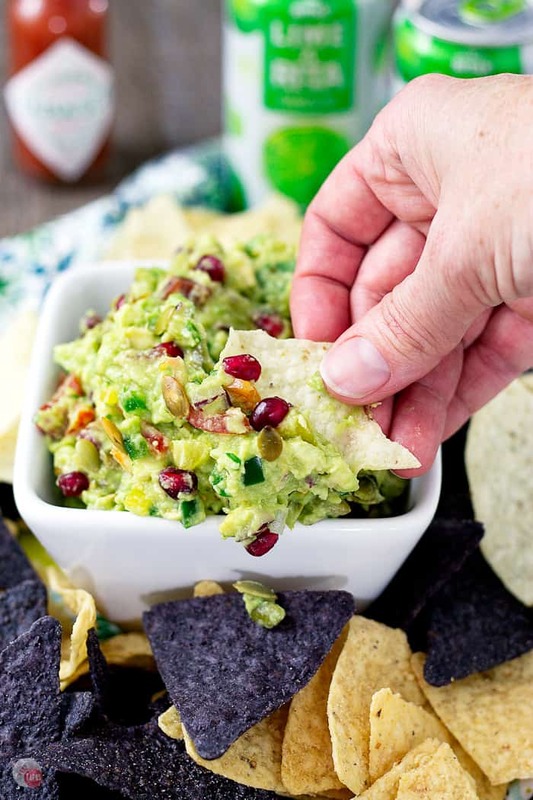 Guacamole is the perfect dip for serving at a party and this sweet and spicy guacamole recipe has the perfect amount of spice and lime and studded with tart pomegranate arils and toasted pepitas! The perfect guacamole recipe is also a simple guacamole recipe. It all starts with the freshest ingredients that are perfectly ripe and full of flavor. Starting with a delicious base is key! Guacamole, simple as it may be, is so versatile and sets the stage for different variations and flavor profiles. Real guacamole contains only avocados, lime, cilantro, onion, and salt. When I found out that the authentic guacamole recipe didn’t contain jalapeño or tomato or garlic for that matter, I was floored. All the times I have eaten guac in my life, it has had these three ingredients. It took me moving to Arizona to discover true guacamole. Having had the original, I feel confident in experimenting with my guacamole recipe and adding in new flavors and textures. 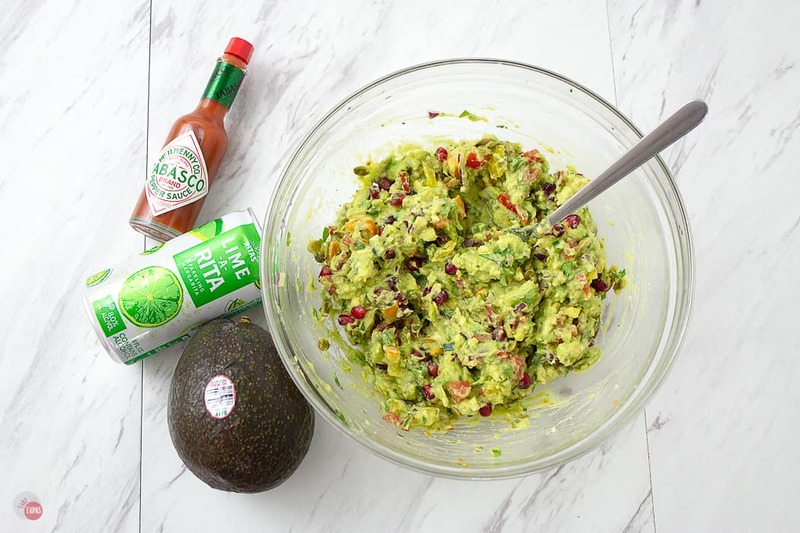 Just take me to the Pomegranate Guacamole Recipe Already! If you’d rather skip my (very helpful, I think) tips and tricks, essential cooking info, and similar recipe ideas – and get straight to this delicious easy Sweet & Spicy Guacamole recipe – simply scroll to the bottom of the page where you can find the printable recipe card. So now that you know true guacamole isn’t spicy, you can shake it off and get back to adding a kick to flavor along with some other ingredients for fun. Let’s start with how to make guac. Slice the avocado in half with a sharp knife. Twist the two halves, separate, and remove the seed. 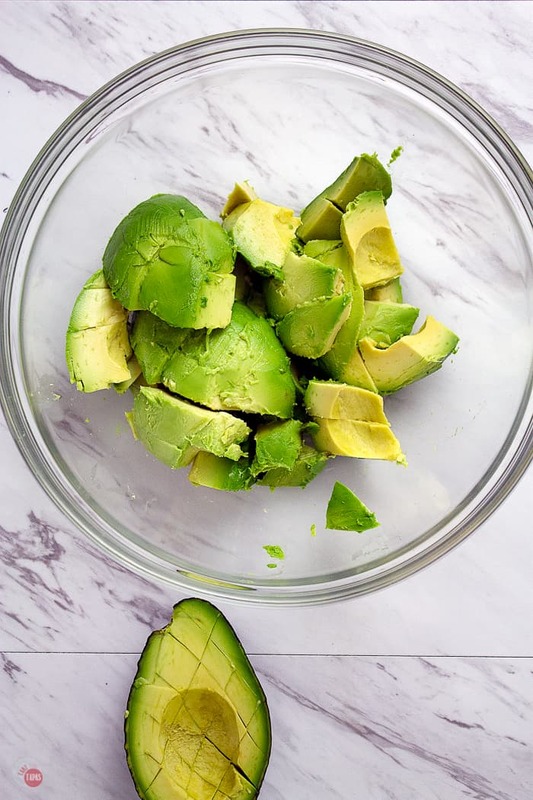 Run your knife through the flesh scoring the avocado into sections (taking care not to cut all the way through the skin and into your hand) and scoop out the avocado chunks into a mixing bowl. Immediately add in the lime juice to keep the avocados from turning brown. Mash slightly with a fork, and add in the cilantro, finely diced onion, and salt. Stir gently to combine as you don’t want to completely mash the avocado into a paste. Add in your flavor enhancers or extra goodies (see below) and enjoy with chips! Now that we have our guacamole, let’s turn it into spicy guacamole! To give the creamy avocados and tart lime a little kick, I add fresh jalapeño and Tabasco® Pepper Sauce. I use Tabasco® Sauce when I make salad dressings and other dips because it is not just a condiment that you add on at the end! The peppers and other simple ingredients that are used in making it, add another layer of heat and the vinegar and salt deepen the flavors of the other ingredients in the recipe. In this case, it accentuates the flavors of the lime and jalapeño! Our guac recipe is spicy, so let’s add some extra goodies that will make it out of this world! True guacamole doesn’t contain tomatoes but I love them!! If I have some flavorful and ripe tomatoes lying around I will chop them small and toss them in. Heirloom tomatoes add a burst of color too! For even more color I like to add pomegranate arils. The arils are a deep purple color, add a little texture, and when they pop in your mouth they release all their tart and slightly sweet juice. I always add these to my guacamole dip when pomegranates are in season. Don’t worry if they are not in season you can still find pomegranate seeds in your produce section already removed from the skin. How easy is that? How do you make guacamole better? Because guacamole is creamy and soft by nature, I like to add in some crunch. I know I know, I can’t leave well enough alone, but a little crunch does add something fun to guacamole. Sunflower seeds used to by my go-to add-in but now I like to add toasted pepitas. Even though they are small, they pack a nutty punch! I fold some in the guacamole and then sprinkle some on top for a gorgeous presentation! Q: Can I freeze guacamole? A: Yes you can, just leave out the onion, tomatoes, and other add-ins. Make the guac with just the avocados, lime, salt, and cilantro and freeze for up to 3 months. Store in plastic freezer bags and be sure to remove as much air as possible. A: Once made, store the guacamole with a cut onion in the container or with plastic wrap pressed down onto the surface, in the fridge for up to 24 hours. A: Yes it is! Avocados from Mexico are a unique, healthy fruit because they contain unsaturated fat or “good fats”, and can act as a nutrient booster by helping increase the absorption of fat-soluble nutrients. All the other ingredients including the onion, lime, salt, and other add-ins are healthy too! Avocados from Mexico are always worth it because they’re healthy, delicious, and always in season. 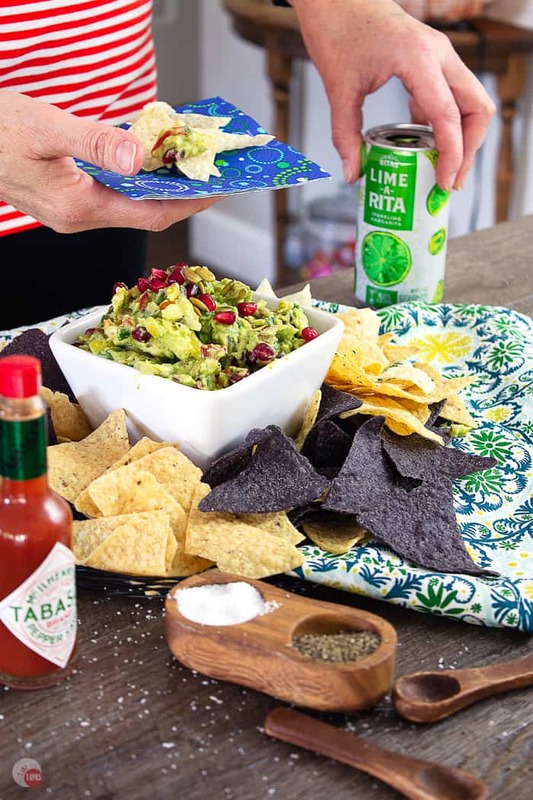 Now that you have the best guacamole on the planet in a serving bowl surrounded by tortilla chips, the tv is on, you’re dressed in your favorite team colors, and all your friends are over to watch the big game, you need something to serve with it! If you are like me you are already picturing, or even reaching for, a margarita. Instead of all that measuring, mixing, and pouring, serve RITAS! 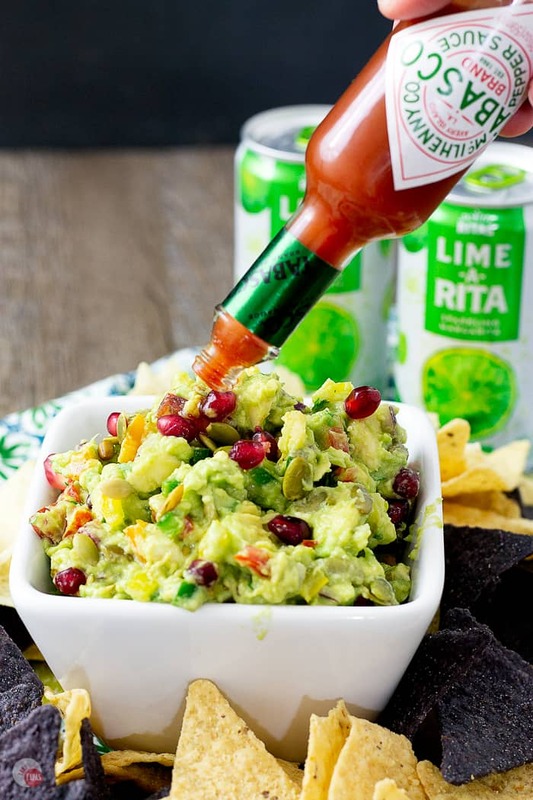 Fizzy and the with the perfect amount of lime, Lime-A-Rita is my favorite of the RITAS, and will help you savor the flavor of this spicy guacamole and the chips you are using to shovel it into your mouth! 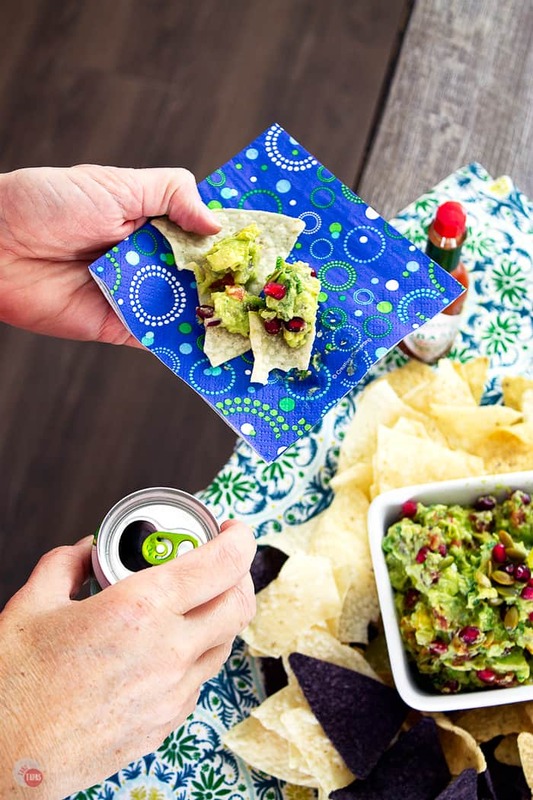 When you are getting ready for the big game by gathering decorations in your team colors, moving extra TVs into the room so everyone can see, and planning your menu of awesome tailgating snacks, be sure to include this sweet & spicy guac. Creamy, spicy, sweet, and with a little crunch, it is sure to be a crowd pleaser. Matter of fact, you might want to make 2 or 3 batches because it is guaranteed to be the first thing to go. Make sure you add an extra bag of chips to the list too! Other great recipes to try! Would you like to win a $1000 prize? Enter here for a chance to at the prize! For other ways to Flavor Your World, Check out Tabasco® Pepper Sauce on Facebook, Instagram, Twitter, and their website! For more inspiration on how to enjoy Avocados from Mexico, follow them on Facebook, Instagram, & Twitter, and check out their Big Game page! Start with ripe Avocados from Mexico. Run your knife through the flesh scoring the avocado into sections (taking care not to cut all the way through the skin and into your hand). Scoop out the avocado chunks into a mixing bowl. Mash the avocados slightly with a fork. Add in the cilantro, finely diced onion, and salt. Add in the jalapenos, Tabasco® Pepper Sauce, and garlic. Taste and add in any additional salt and pepper if might need. Gently fold in the pepitas and pomegranate arils, leaving a little out of each to garnish the top. Sprinkle the top with the remaining pepitas and arils. Transfer the spicy guacamole to a serving dish and surround it with plenty of chips! For maximum enjoyability, serve with a Lime-A-Rita! I could eat guacamole every day til the cows come home. This one looks so delicious! Wait, what? Guacamole doesn’t have tomatoes and jalapenos?! I guess I’ve never eaten it outside of Arizona. Lol. How DO the rest of the country even enjoy it?! I have never wanted tortilla chips and a bowl of guacamole as badly as I do right this moment!! You have absolutely PERFECTED guacamole!! Love everything about your additions! Ooooh, I happen to have some avocados that need to be transformed into this spicy guacamole. The added pepitas and pomegranate arils are just the right amount of texture to give this dip a boost from the regular guac I’m used to! 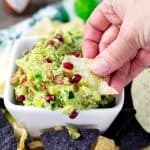 I love this delicious twist on guacamole! So clever and delicious. I love avocados from Mexico, they are the tastiest for sure!! I love guac and this version looks amazing. I love the pomegranate and Tabasco for a kick too! I love your tasty twist and update, what a yummy guac! The pepitos and arils are really a nice crunchy finishing touch!